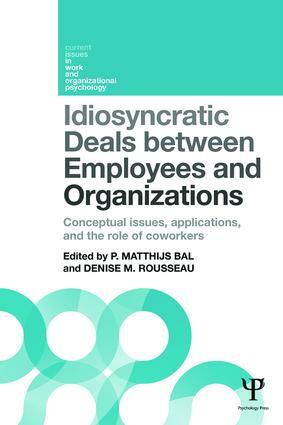 Idiosyncratic deals, or i-deals, are the individualised working arrangements negotiated by employees with the organizations for which they work. Such deals represent an emerging area of study into the effects they have on both parties, as well as co-workers and the wider working world. Do i-deals signify a further breakdown of collectivism within the workplace, or should they be seen as empowering to those employees able to find themselves the best deal? Is the growth of i-deals an inevitable response to the need for more flexible working relationships, or do they erode concepts of equality and fairness? In this important new collection, i-deals are discussed from a comprehensive range of viewpoints. The book examines how i-deals alter the psychological relationship between employee and employer, as well as the notion of career development in an aging and technologically literate workforce. The issue of group relationships is also discussed, in relation to leadership theories, organizational justice and perceived fairness. Finally, the impact on organizational and individual effectiveness is assessed. Are i-deals a good thing for employers looking to maximise productivity within an organization? Do employees work more effectively and efficiently as a consequence of i-deals? Very much a hot topic, this volume represents a key contribution in the area of i-deals from the most active researchers in the field. It will be important reading for all students of work and organizational psychology, human resource management and business management. How do coworkers judge the distributive fairness of i-deals?